It doesn't get much simpler. Take you favorite milk chocolate candy bar, we went with a bar with nuts, and slit a banana down the middle. 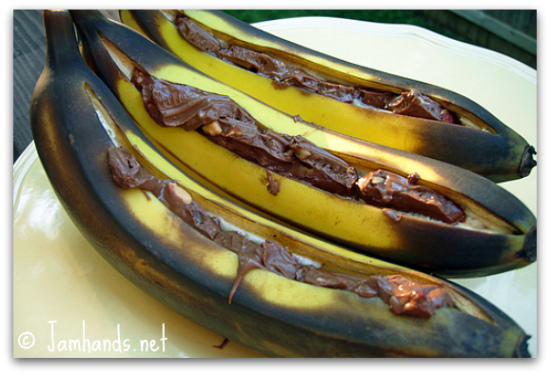 Stuff banana with chocolate. Let grill for just a few minutes. Whipped cream would take this to the next level, but even without it is absolutely delicious. 1. Slit bananas down the middle, leaving peel on. Stuff with pieces of chocolate. 2. Grill for a few minutes. When chocolate starts to melt, they are done! Serve with whipped cream. Add marshmallows for more yummy gooey-ness! 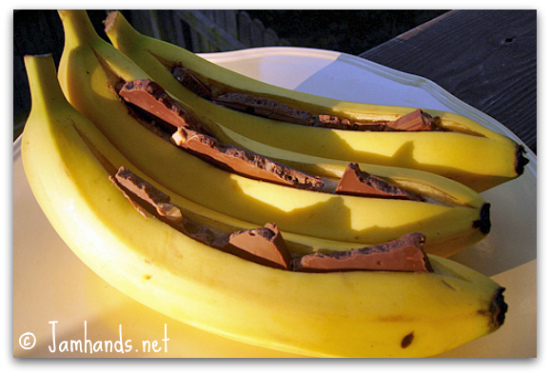 We used to make these at Girl Scout camp...slit the banana, add chocolate chips and marshmallows, wrap with tin foil and throw on the fire for a little bit. Sooo good! We've been making these for years and they are fabulous!!! The pics are yummy Ali, great job. I'm with Moe, add some marshmallows and you have some kind of crazy yummy snack. This is exactly why I love you. EXACTLY! Oh man! I haven't thought about those in FOREVER! We used to make them in girl scouts. Only we would wrap it up in foil and set it in the coals. YUM! Well, this certainly looks easy and a great idea for teenagers!! Hey, I am SO glad I saw this BEFORE I went out to grill our steaks! I've got dark chocolate so that'll have to do. Does your sister still have her blog? I can't find it in my favorites and don't see a link on your blog. LMK. Yum! My sweet tooth is kicking in. Will definitely have to try those. ok, so I must live under a rock or something! I've never heard of this! But we will DEFINITELY give it a try! They sound delish!!!! Oh Yum!!! I think I need to go buy me some bananas. Am enjoying your blog...just stumbled ontoit while I was googling "roasted edamame". I just bought a bunch of bananas with this in mind. Thanks for the idea - and thanks for linking with Sweets This Week. i found you from sarah's blog! this looks awesome, i bet it'd be good with white chocolate.